We're closing in on the end of October! Can you believe it? Christmas will be here before we know it! Ack, are you ready? I'm not... Okay I'm very ready for the colder weather and the jolly season. I'm just prepared yet in my gift shopping. That being said, I'm super ready for Thanksgiving! Bring on the yummy holiday food! 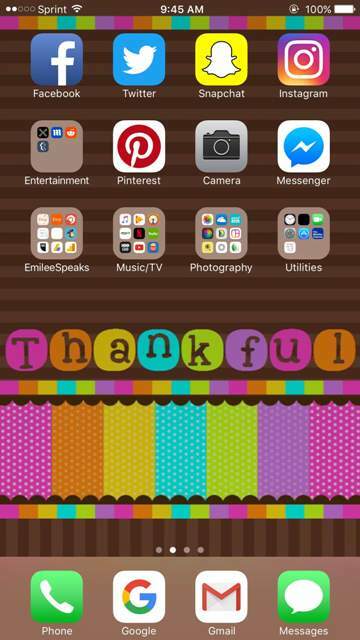 October was an awesome month for Emilee Speaks and I'm so proud of my brand and I'm humbled daily by all of you. Let's check out what happened in October. I released several new clips this month. Stepped out of my norm and made a few amazing pieces (some not released yet). 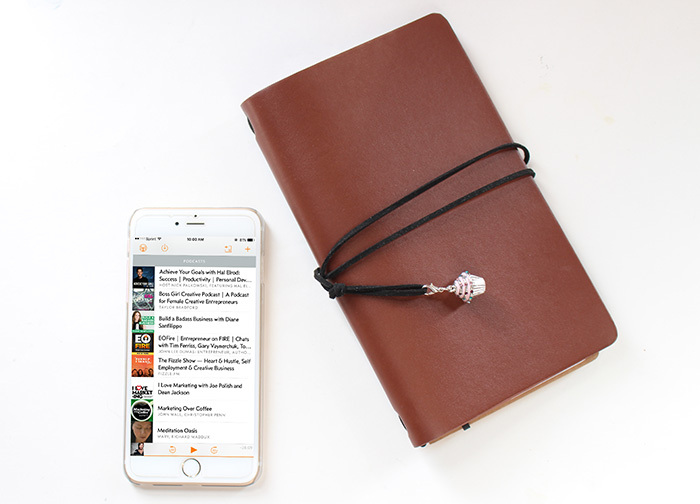 I've added hoodies, a camera, and an adorable fall weather charm (below). Filming for September was very minimal. I got a new puppy (yes, I'll blog about her soon) and she really took up a lot of my time. She's a handful, she owns my heart, but she's a handful. She has kept me crazy busy the last 2 months. Halloween is my favorite holiday though so I made time for some awesome Halloween Planner Decoration videos. 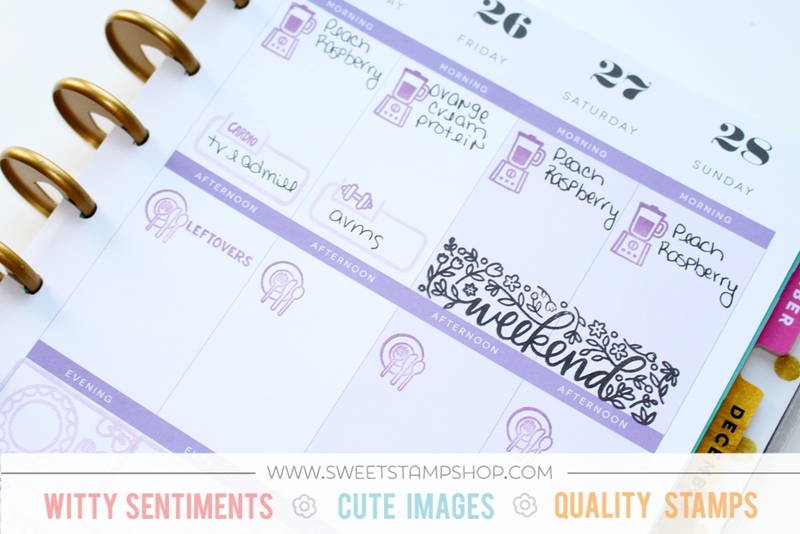 I branched out and found a few different digital stamp shops on Etsy and used a few of those stamps. I'm not finished with my Halloween filming yet. 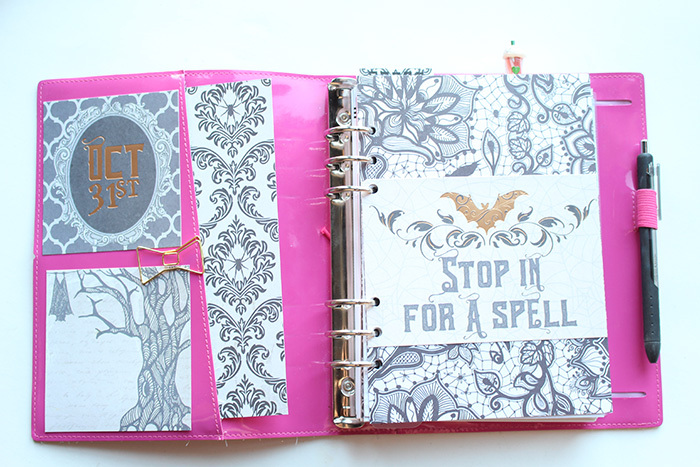 I still have 1 more spread I want to do and I'll do a flip through of the completed month. I'm amping myself up to do a talk through true Plan With Me style video. So be looking forward to that soon! 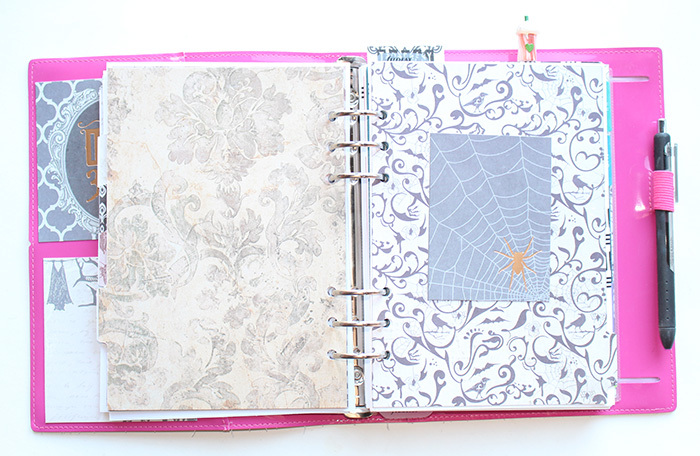 October, I brought a couple awesome DIY tutorials for you. 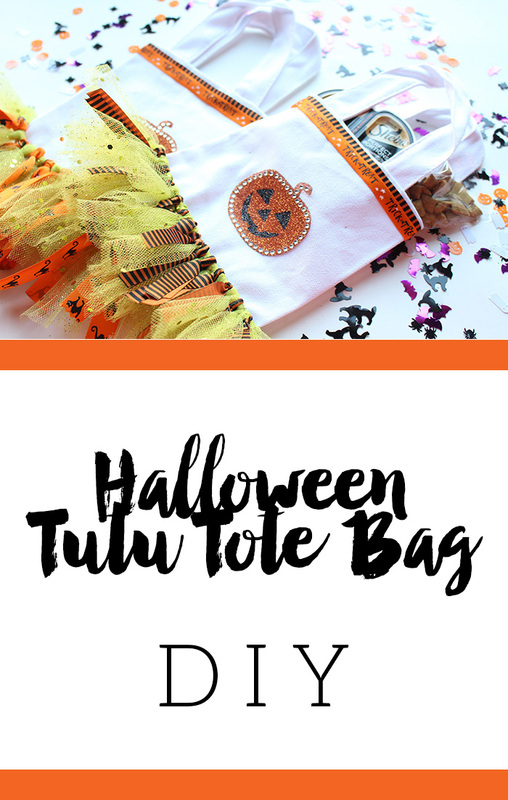 I made Halloween tutu treat bags, and a fall candle in a coffee mug. If you haven't checked those out yet, you definitely need to. I had so much fun making these tutorials and plan on bringing you more like them in the very near future. Looking ahead: For November I plan on bringing you more YouTube videos (hopefully some voice overs or talk through's). I'll also be bringing you some posts about the new love of my life, the new puppy. If you can't wait to see her, check out her Instagram "@calliope_speaks". 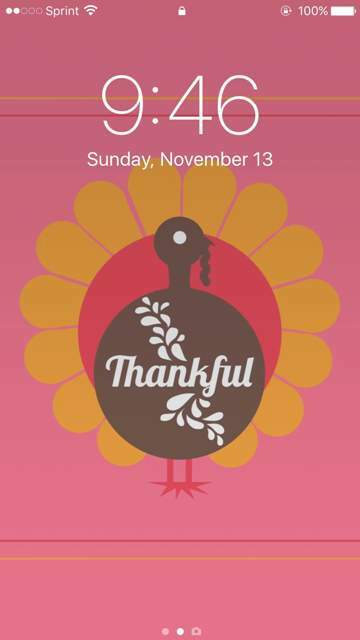 November's theme is going to be about being Thankful & Grateful. I have several great posts lined up for some awesome inspiration. As always, thank you all for everything. I love each and every one of you! It's no secret I love coffee. I literally cannot start my day without it. 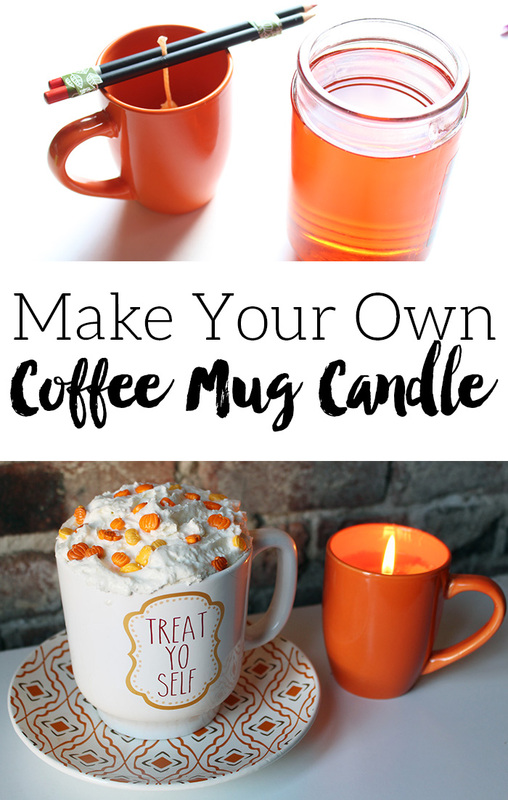 I also love seasonal living and today I'm bringing the two together in this perfect Fall DIY. I burn candles year round with seasonal inspired scents. When the wick is done and your candle will no longer burn, there's always a good inch of wax left in the candle. I hate wasting this wax, I always hoard save it. One of my favorite fall candle scents is a fall leaves scent. I had enough wax hoarded saved in this scent that I decided to make my own candle. 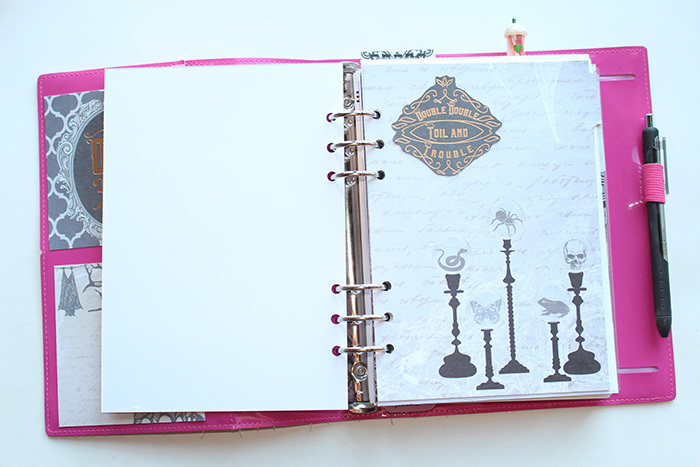 It was so easy and I was so pleased with my project, I decided to write a DIY for you. Today I will be using a new unused jar candle that the glass was broken on. Instead of throwing it away (and wasting that money) I'm making it usable again. You'll want to get a large pot (preferably an older one that you don't care about just in case) and fill it with water and bring to a boil. Lower the heat to med/med high. 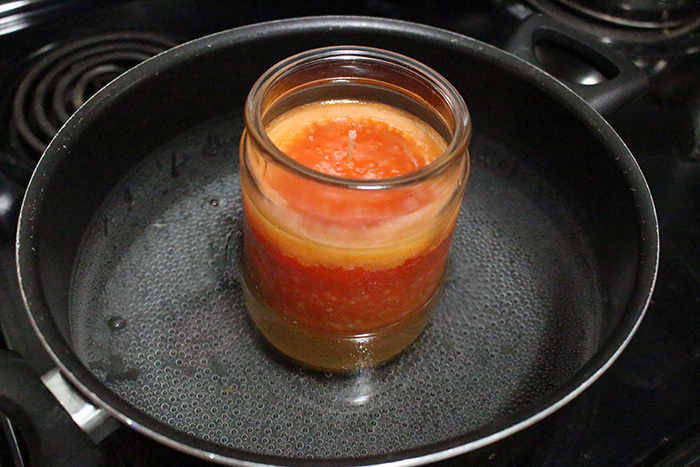 If you're using wax bits from old candles, add them to a glass dish or an old empty candle jar that you have. Since I'm using a brand new candle with a broken jar, I just placed it directly into the water as is. Now you'll just be patient and wait for the wax to fully melt. 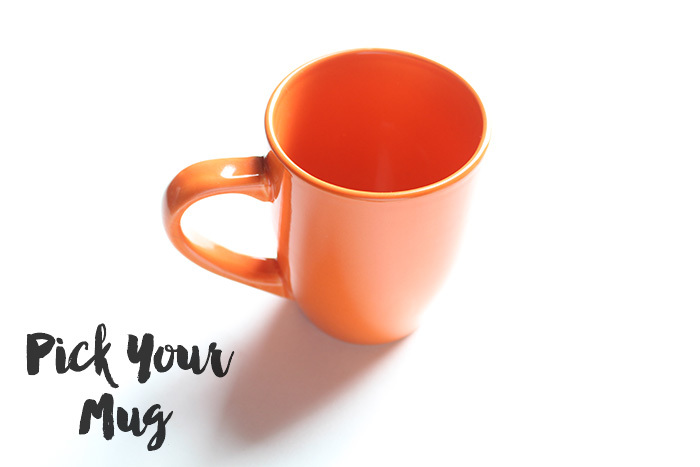 Get your mug ready while your wax is melting. I purposely picked up some inexpensive fall colored mugs for this project. If you're melting old saved wax from past candles, you'll need wick. You can pick up wick pretty cheap at your local craft store. Since I was using a full unused candle, I just used the wick this candle already had. 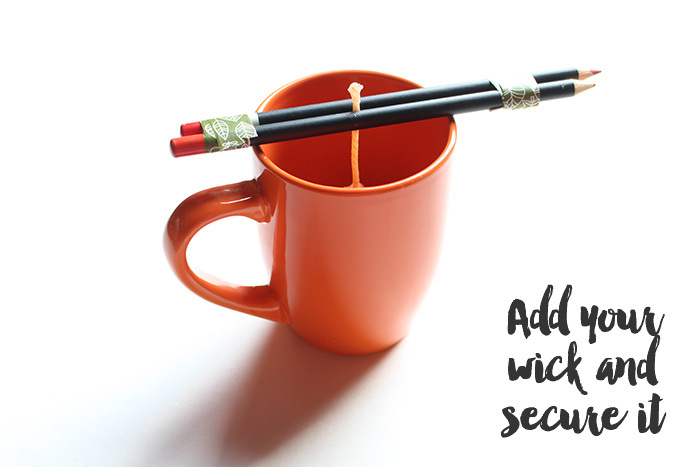 You'll need to secure the wick in the center of your mug. You can use anything for this. 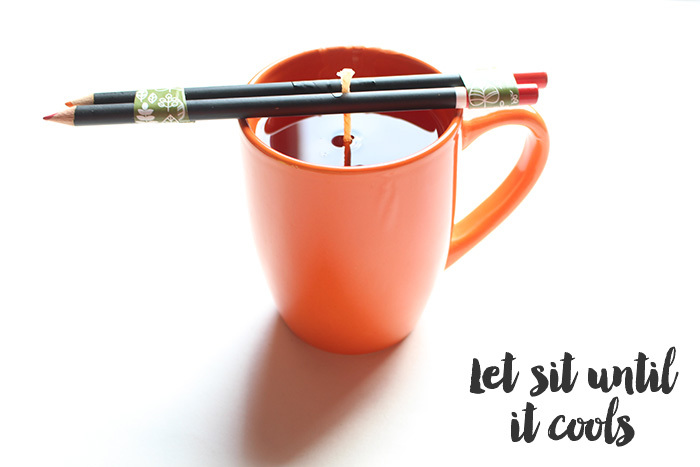 Chop sticks, pencils, cake pop sticks, whatever you have on hand. I chose colored pencils that I had on hand. I secured the ends of the pencils with washi tape to hold them in place. 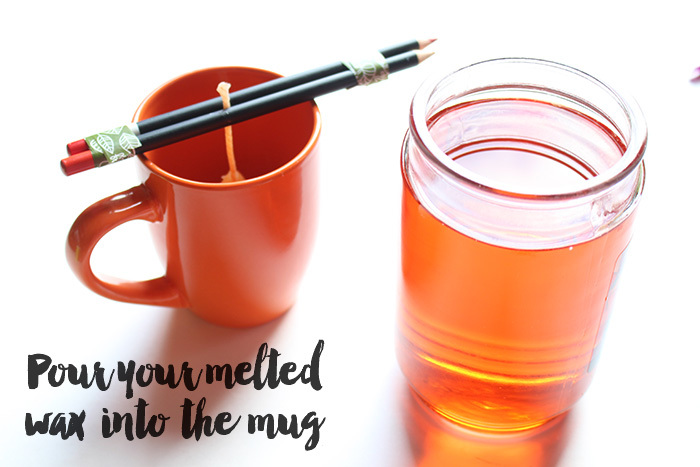 Once your wax is melted you will pour it into the mug. This has the potential to be messy. I luckily didn't make a mess at all which is very surprising because I'm pretty clumsy. Be sure that you're doing the pouring over a covered surface in case there's a mess. Let it sit until it cools! By the way... your home is going to smell amazing while you make this project. My home was filled with my fall leaves candle scent the entire day after I made this candle. I'm not complaining! 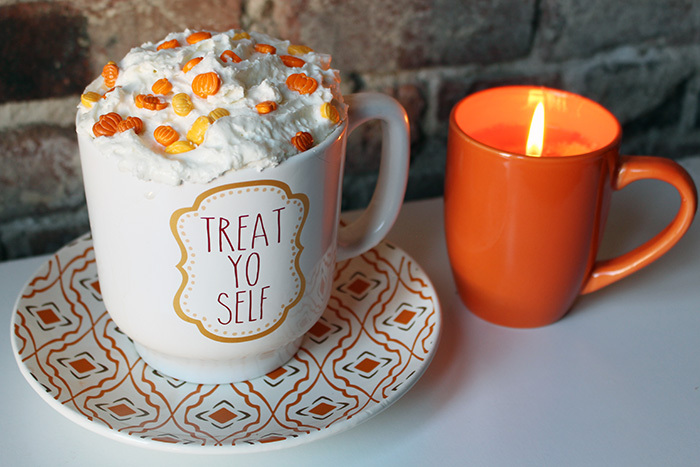 This tasty little treat is perfect for a fall day. It's easy and requires very little ingredients. All you need is Dunkin Donuts® Bakery Series® in Vanilla Cupcake, Dunkin’ Donuts® Coffee Creamer in Extra Extra, some whipped topping, and sprinkles. How CUTE are these fall pumpkin sprinkles I found at Dillons?! 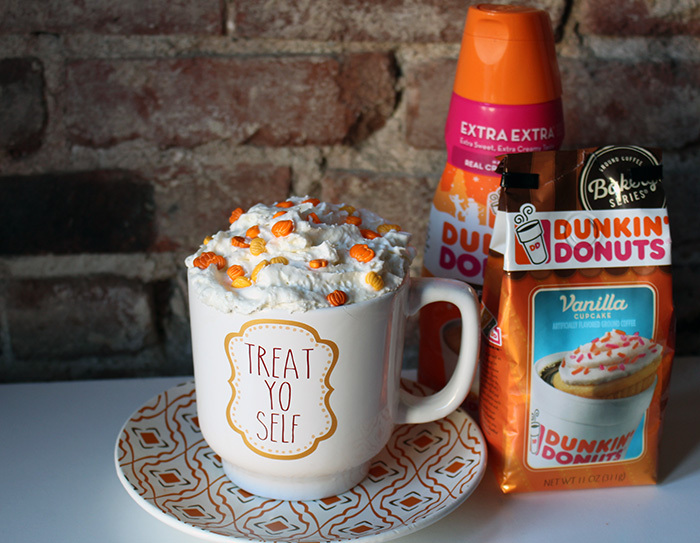 Just brew up your Dunkin Donuts® Coffee, add however much Dunkin’ Donuts® Coffee Creamer you prefer, top it with the whipped topping and sprinkles. 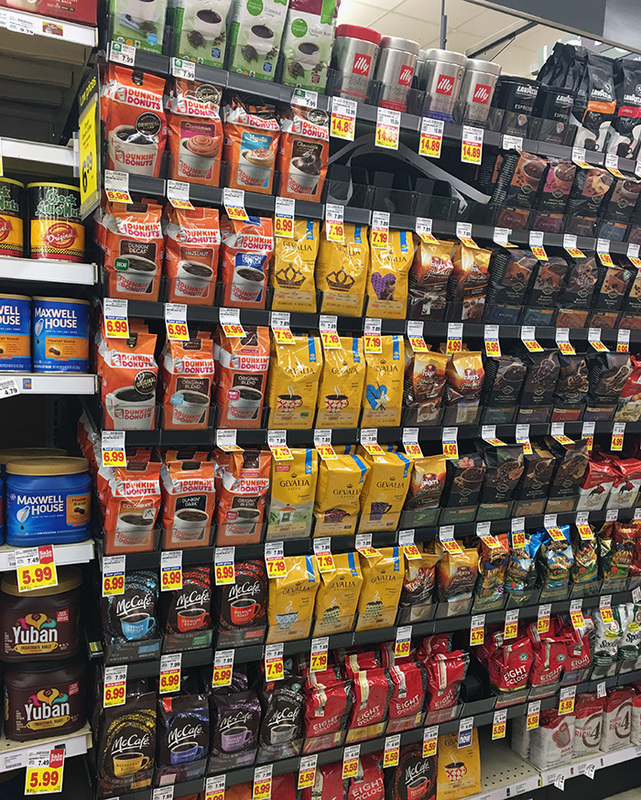 Dunkin Donuts® Bakery Series® coffee is located at your local Kroger or Kroger banner store in the coffee isle. 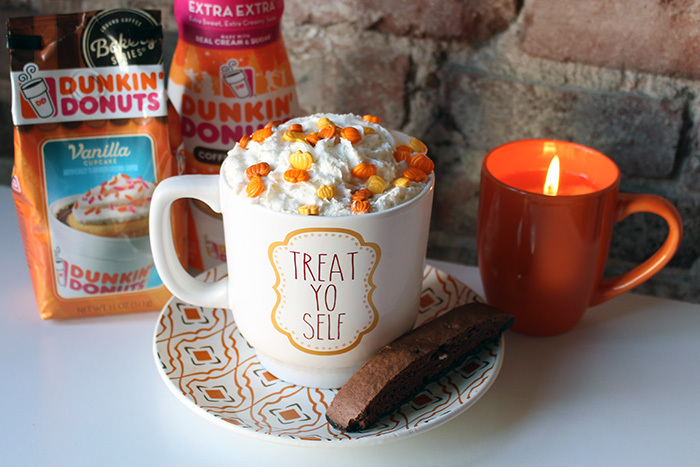 I'm so excited about the Dunkin Donuts® Bakery Series® coffee and can't wait to create more decadent coffee treats with it! 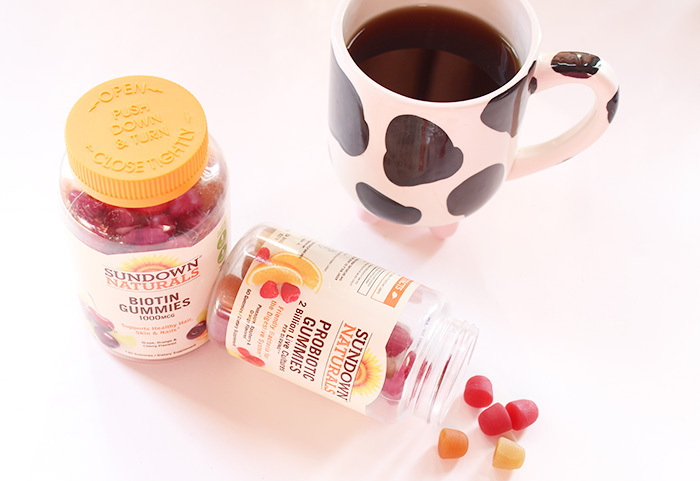 Have you tried the Dunkin Donuts® Bakery Series® coffee? Tell me what your favorite fall coffee is. I'd love to know! I love October & Halloween! It's one of my favorite months. Fun fact: I have more home decor for Halloween than any other holiday. Halloween is just so fun and festive. It always puts me in the mood to create. 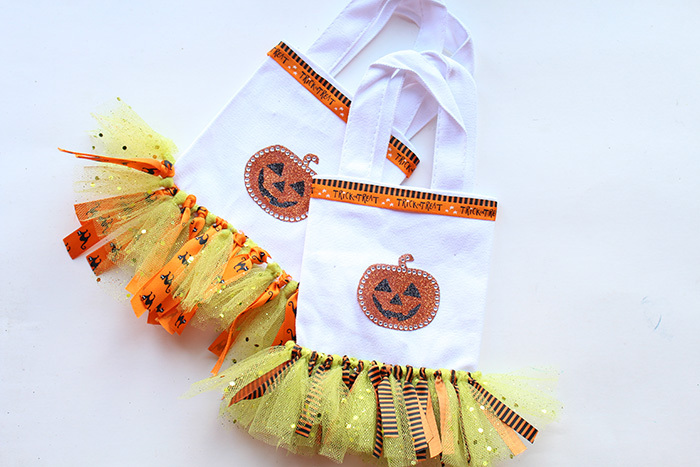 Today I'm bringing you this DIY for Tutu Bag BOO Kits! First you're going to cut down your tulle and ribbon. The length will vary depending on the size of your bag and your preference. For my bags, I just wrapped tulle around my phone lengthwise, then cut the ends. This cut my tulle into individual pieces all at the same time. Then do the same with your ribbon. Okay... 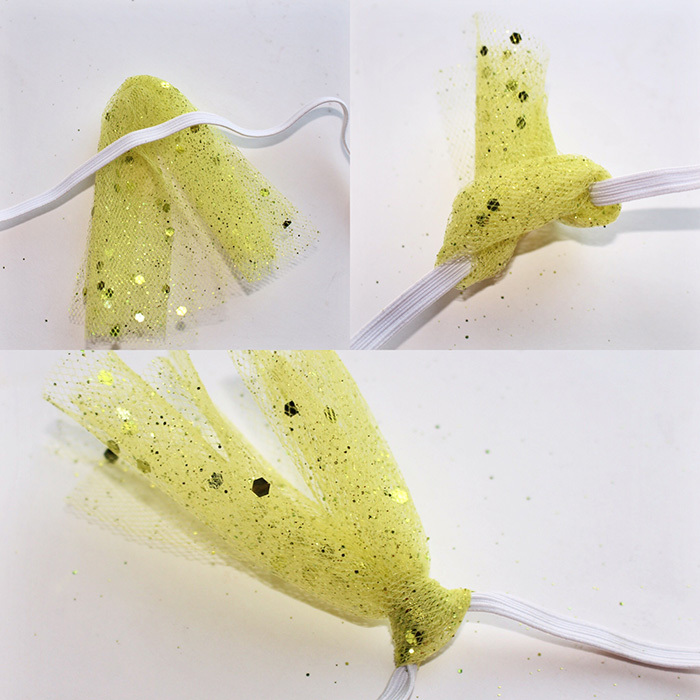 So to make the tutu you're going to take a piece of tulle, fold it in half, then place the elastic over it (see picture 1). Then you're going to pull the tails up through the loop over the elastic (see picture 2). Once you have that, you'll pull it taught on your elastic (see picture 3). You'll do this the entire length of your elastic. After that do the same with your ribbon in between each piece of tulle on the tutu. Then center your decal in the middle of the bag. My decals were super sticky but if you're using something less sticky, feel free to glue that on as well. 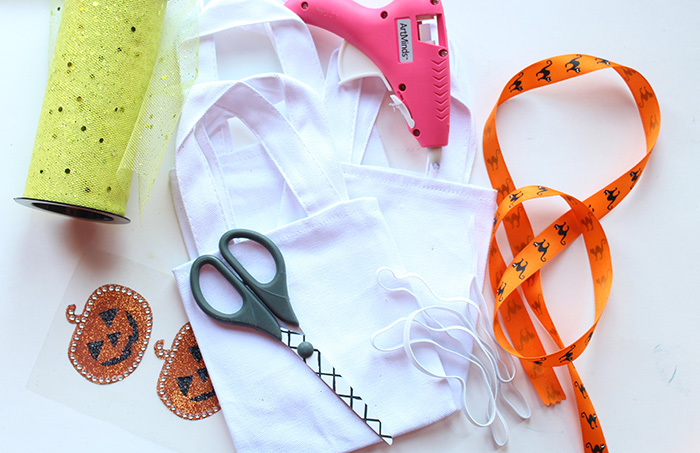 Once you have your super adorable tutu you're going to hot glue it onto your canvas bag. Of course you could sew it if you prefer (I stink at sewing, so I used hot glue). Next we're going to hot glue ribbon around the top of the bag. I found a few different ribbon patterns that I loved, so I doubled up and made two layers. How. Cute. Are. These?! 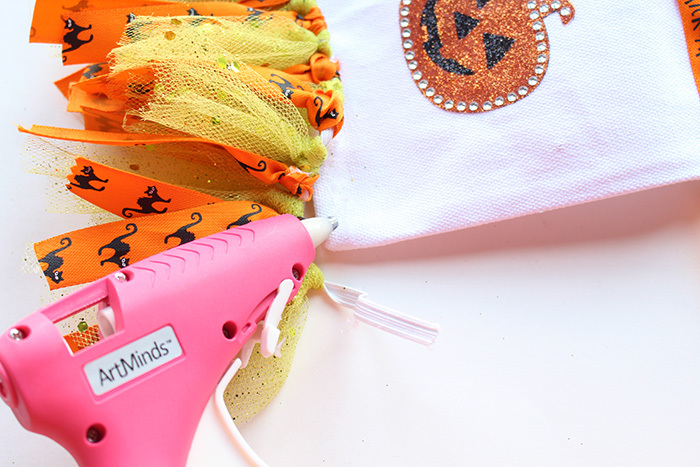 They're ready for your Halloween BOO Kit goodies! I'm making my BOO Kits for all the 4-legged friends I know & love. 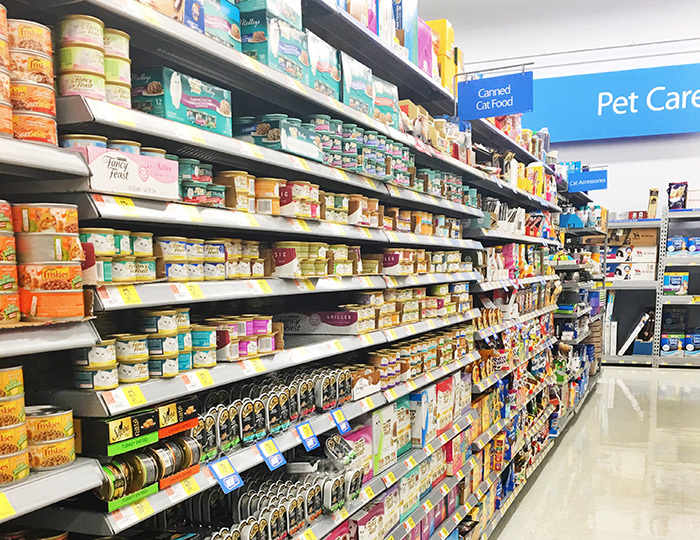 I took off to Walmart to find the perfect treats for my Pet BOO Kits. 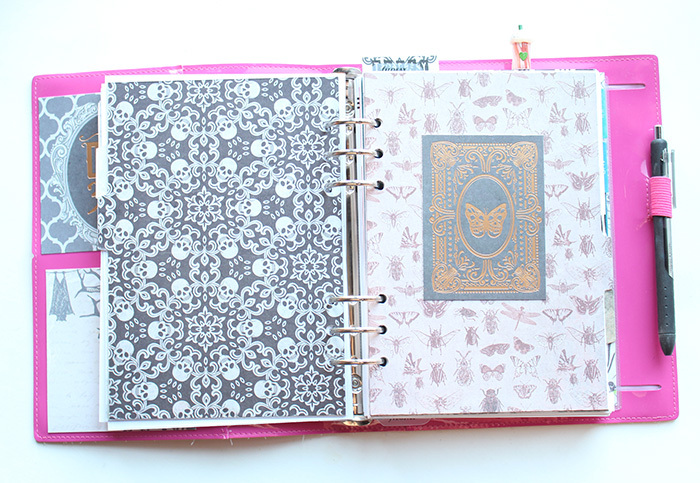 Walmart was the perfect one stop shop for the entire BOO Kit project. You can even shop walmart.com for your BOO'ing necessities! I browsed around the Cat Food & Treat isle and picked up some yummies! 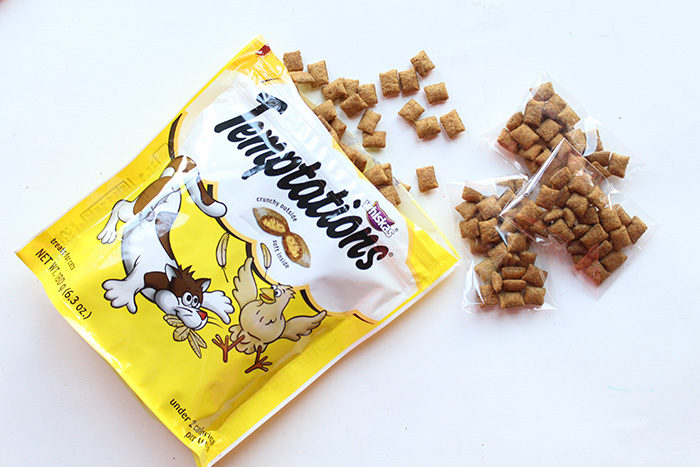 I purchased Temptations® treats in Savory Salmon & Tasty Chicken. 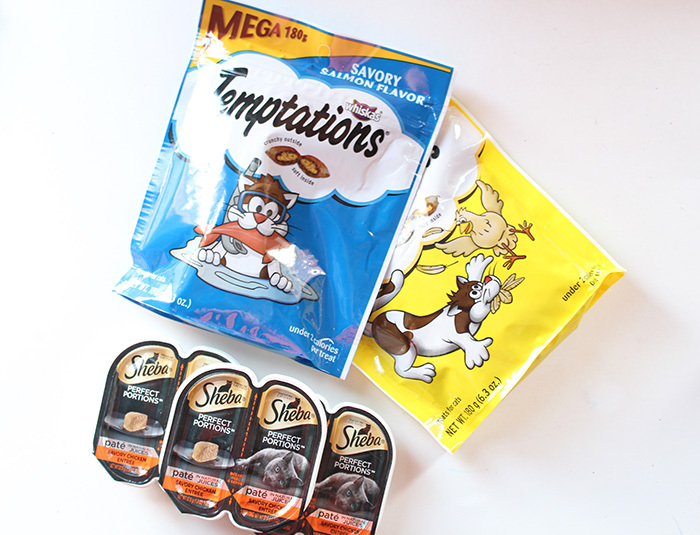 The Temptations® MEGA bags have 6.3oz of treats inside so these will go a long way. I also picked up SHEBA® PERFECT PORTIONS™ in Savory Chicken Entree Paté. These SHEBA® PERFECT PORTIONS™ are a great size to add to the bags and they're a nice fancy treat for the kitties. 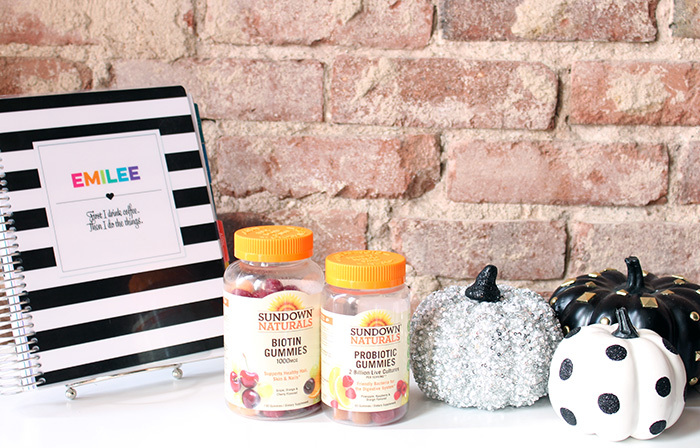 Now we're ready to put our new Temptations® & SHEBA® PERFECT PORTIONS™ goodies into our BOO Kits! 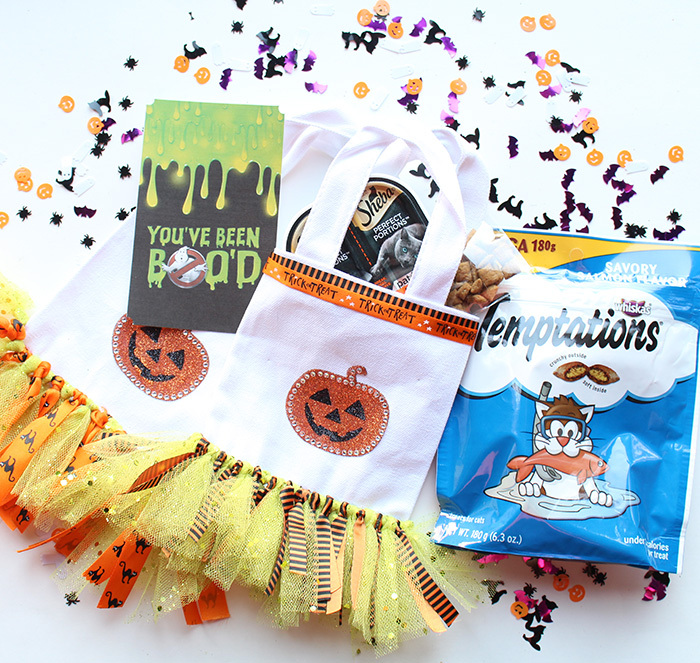 I divvied up the Temptations® treats into individual portioned bags to put into my BOO Kit. Of course while doing so, I gave a few to my own kitties who were very interested in what I was doing! 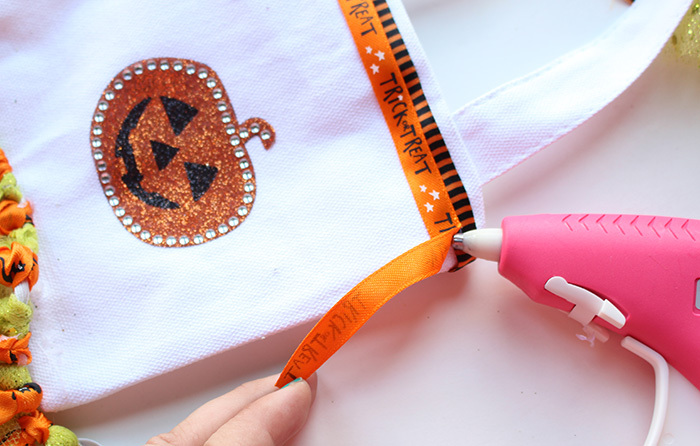 DOWNLOAD A FREE PRINTABLE CARD AND CHECK OUT MORE BOO KIT INSPIRATION HERE! 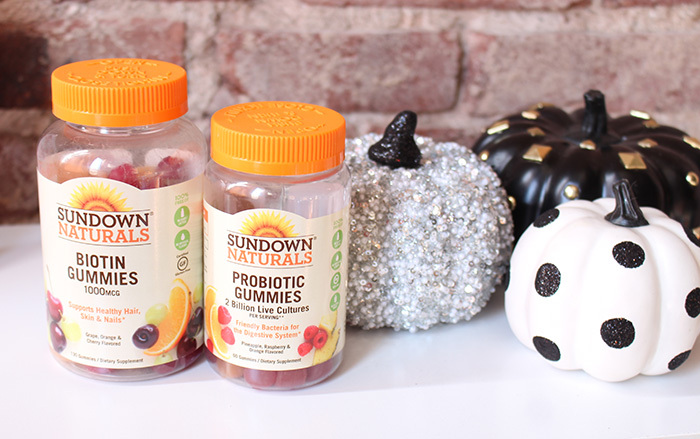 Who will you be BOO'ing It Forward to this Halloween? Sweet Stamp Shop: I'm on the Sweet Stamp Shop blog sharing my Health & Fitness Planner! You can view the post below, or go check out the SSS Blog! Hello friends! Emilee here and today I have something a little different for you animal lovers. Let me give you a short backstory: About 4 weeks ago, we adopted a puppy from the Humane Society. Normally I wouldn't have chosen a puppy, but I fell in love with her and she honestly looked like an old dog! Then we found out she was only 6 months old. She has been the most amazing companion for the last month. I have a very very busy daily schedule. I am lucky enough to work mostly from home, but my day is still jam packed. Having a puppy is like having a toddler... She puts everything in her mouth, she eats, sleeps, and potties. I live in an loft apartment in the business district of my city and the closest grass is 2 city blocks away. This requires a well thought out meticulous potty break and walk schedule. So being the planner girl that I am, I created a planner just for baby dog! 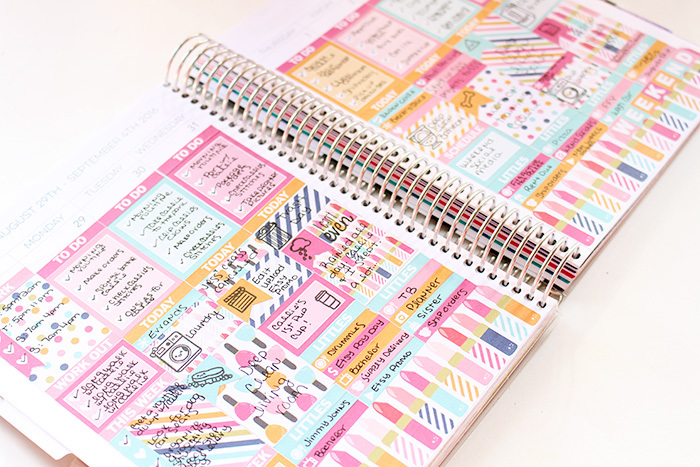 I grabbed a spare Happy Planner (I have an addiction to purchasing these and having no use for them, they're just so cheap!) that I had on hand. 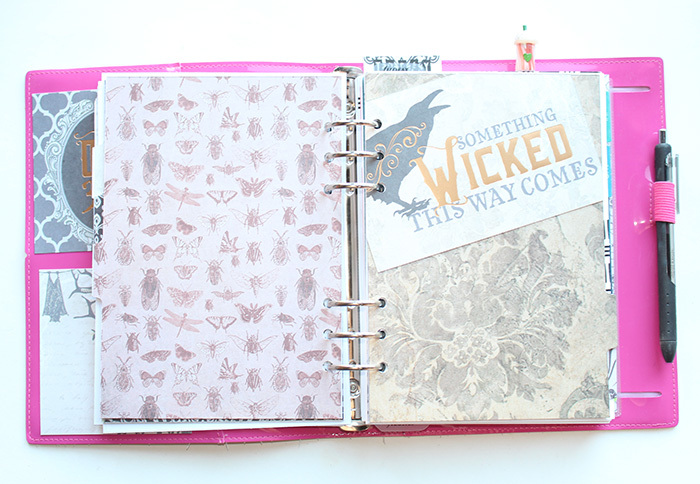 I got out some scrapbook paper and my Sticky Sweet stickers to create a cover. 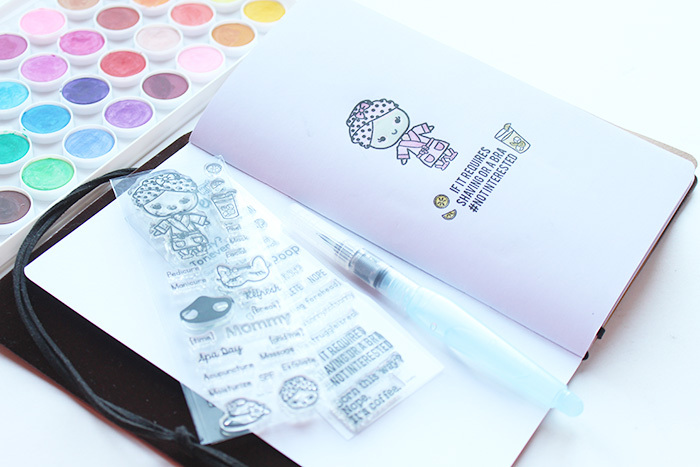 I used Sticky Sweet "Dog & Cat" and "Lower Outline". I colored the Sticky Sweet stickers in with colored pencils, then ran the cover through the laminator. 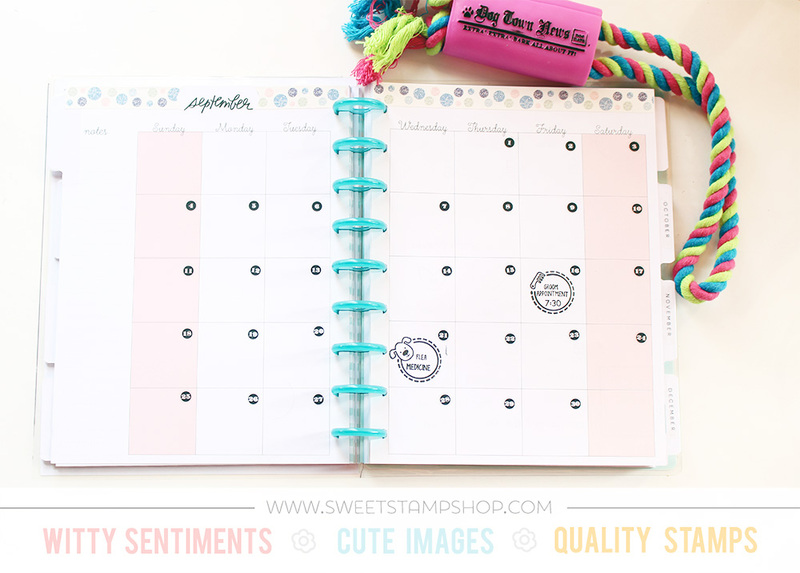 I'll be using the month on two pages to notate appointments & when she needs flea medicine. I'll also track other preventative medicine here like heart worming, then also notate little milestones and memories. Now for the meat and potatoes of the planner... I sit down at the start of each week and plan our week. I try really hard to keep our routine the same, but some days I have to alter bathroom walks around things I have to do that day. This helps me stay organized and have our day scheduled so there's no surprises. 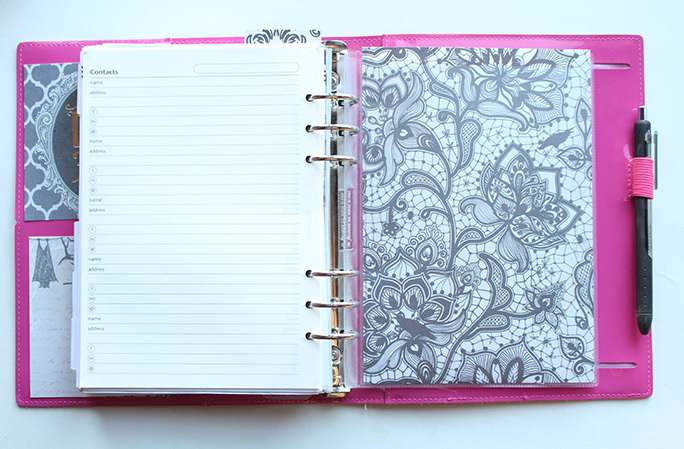 I put special appointments in just like you would your personal planner. Like this week, Callie has a grooming appointment on Friday. Each day I'll schedule walks, dinner times, training sessions, appointments, and designated play time. I obviously play with her all throughout the day, but she's a puppy and very active. She needs a good long play session to tire her out so she doesn't get bored and misbehave. 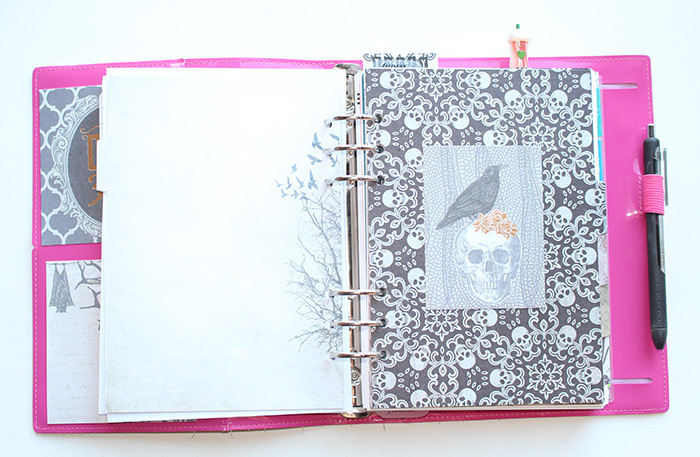 In my sidebar I use the "Notes" section for anything I need to write down and remember. I also put a shopping list at the bottom of the sidebar to remember what I need to pick up specifically from the pet store. I have cats too, so you'll see "cat food" on my shopping list. They obviously don't need a planner, so their shopping list gets merged in with this one. This is a quick and easy way to stay on top of your pet schedules if you have a lot going on like I do. 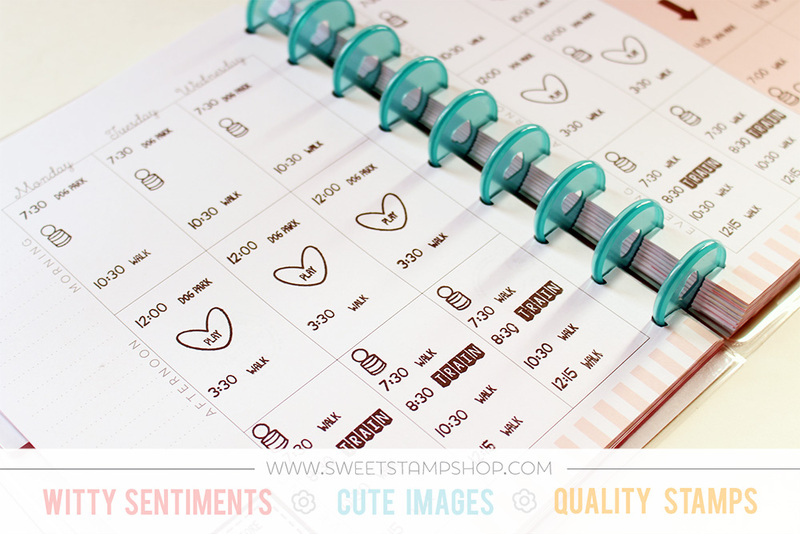 I love using my Sweet Stamp Shop stamps in this planner to make things cute. I know I'll want to look back on her planner when she's older and remember her puppy days. I'll even add in pictures along the way. 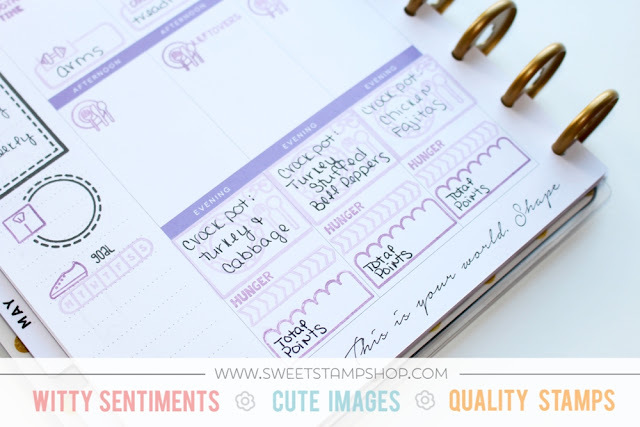 The primary purpose of this planner is to organize our day, but I'll treat it as a memory book as well. 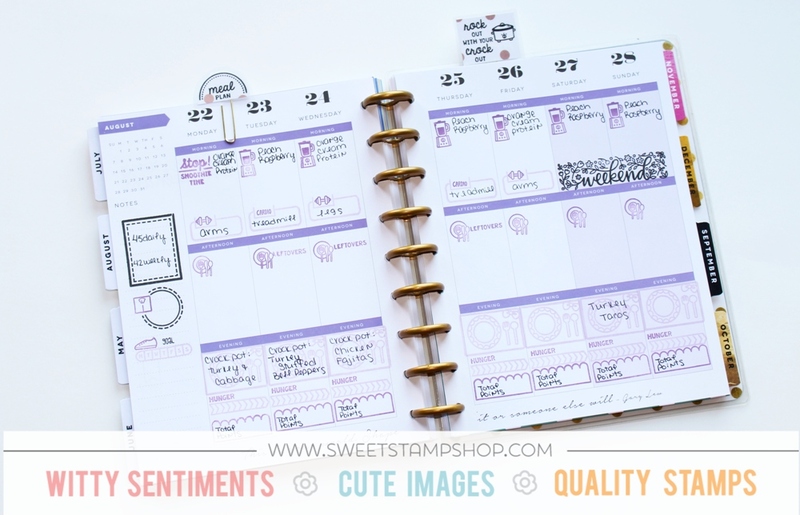 You don't have to have a special planner for this if you don't want to. 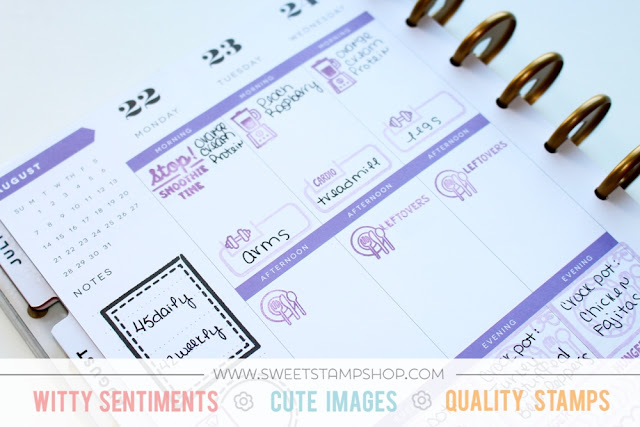 You can just use some of these ideas and stamps and incorporate them into your personal planner. 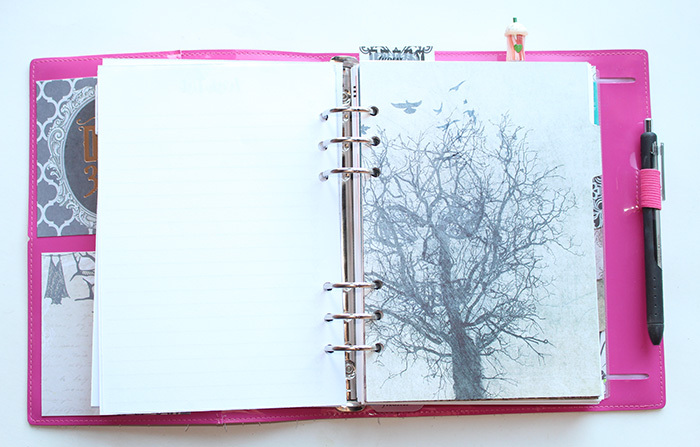 With planning, it's always most important to just do what makes sense for you and your day.